Teaching CSE French in the mid 1970s to reluctant teenagers was often a pretty soul destroying affair! I gave it some thought and decided I would. I ended up teaching at a local primary school and thoroughly enjoying the buzz of creative activity and vibrancy of the teachers and younger pupils. In Britain, it is common for many schools to celebrate a ‘Book Week’. One year, early in 1986, Sandra Pollerman, a marvellous American storyteller, came to perform at a Book Week event for the school where I was working. Everyone, from the children through to the Headteacher, were mesmerised. As I sat enjoying Sandra’s storytelling – which was completely book free – I was transported back to my childhood village of Delices. Have you ever driven across an unlit country road after dark? Or could you possibly imagine life before electricity? Well, as Sandra was performing, I could. Tropical night would descend thick and fast, enveloping the village in a cloak of velvet darkness. Frogs, crickets and cicadas took this as their cue to start up a shrill dusk chorus, noisy and persistent, lasting throughout the night. Millions of shimmering fireflies would also come alive, performing a hypnotic dance in accompaniment to the other insects. Humans however, had other ideas. Without bright lights to lesson the gloom and not much by way of entertainment, Dominican villagers would go to bed quite early, soon after sunset in fact. But when there was moonlight, that was another story. And the Devil and his wife about”. In other words, villages bathed all over in pale flourescent light would come alive with human activity and stay awake till long after sundown. Everyone, young and old, enjoyed an extra hour or two before bedtime, squatting on doorsteps, perched on stools or logs in the yard, or lounged in easy chairs on the verandah, munching on roasted sweet corn and telling and listening to “contes” (stories). For me it was sheer magic! From the day that Sandra Pollerman came to Thomas Gamuel school, I was intoxicated and hooked – and decided to become a storyteller! I must also pay tribute to my good friend June Young, who also taught with me at Thomas Gamuel School. 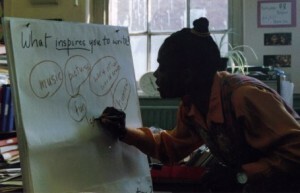 June was an infectious storytelling enthusiast who went to Jamaica to collect stories and greatly influenced me.